Taiwan’s Sing Da Marine Structure Corp. (SDMS) will be supplying 56 jacket foundations to Denmark’s Ørsted A/S during 2020-2021 under a major deal that was signed between the two parties on 12 November. Ørsted will be deploying these foundations as part of its construction of two offshore windfarms located alongside the western coast of Taiwan. This is also the largest order that Ørsted has ever placed for jacket foundations. The supplier SDMS is a wholly owned subsidiary of Taiwan’s China Steel Corp. (CSC). Named after the Singda Harbor of Kaohsiung, where it is located, SDMS was set up by CSC with a registered capital TWD 3.421 billion. As a key participant in Taiwan’s supply chain for offshore wind power, SDMS will be investing a total of TWD 6.842 billion to establish a base for fabricating jacket foundations. The groundbreaking ceremony for the production base already took place on 15 April, and SDMS aims to complete the construction of all the facilities at the site by the end of 2019. Afterward, the company will immediately begin processing the order from Ørsted. 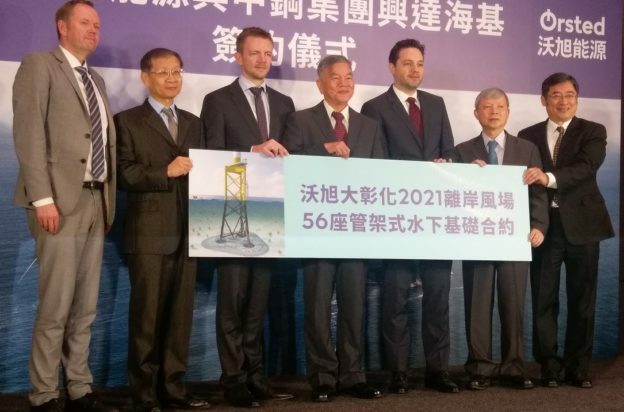 Currently the world’s largest developer of offshore wind projects, Ørsted is working with Taiwan’s government via its partnership with CSC to build offshore windfarms. The deal with SDMS specifically pertains to two windfarms that are near the shores of Changhua County. The cost of procuring the 56 jacket foundations for Ørsted’s “Greater Changhua Project” is estimated to surpass TWD 10 billion. Each of the jacket foundations that SDMS will be delivering to Ørsted weighs more than 1,100t and is around 75m in height. It will be able to securely support an 8MW wind turbine and its tower that stand above the seawater. During the signing of the contract, Matthias Bausenwein, who serves as the chairperson of Ørsted Taiwan and the president of the company’s entire Asia-Pacific operation, stated that this order is the largest ever placed by his company worldwide for jacket foundations. Bausenwein also believes the deal to be the largest of its kind by transaction volume in the global market for offshore wind power during 2020-2021. Responding to the deal, Lin Horng-nan, the president of CSC, said that 20 companies have been brought together to form the domestic supply chain for offshore wind turbines. Furthermore, this supply chain is expected to create at least 2,000 local jobs in Kaohsiung. Also, Taiwan’s Minister of Economic Affairs Shen Jong-chin stated that SDMS must deliver high-quality jacket foundations to Ørsted on schedule so as to meet the domestic demand for renewable energies.